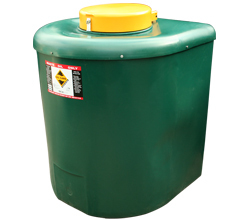 The Ecosure 710 litre Waste Oil Tank is ideal for garages and work shops and any industry that uses waste oil. Complete with an 8" mesh filter that will stop large objects from getting to the tank. The Ecosure 710litre Waste Oil Tank is made from MDPE (Medium Density Polyethylene), bunded to keep any leaks from spilling out on to the factory/workshop floor.